These projects... helped cement the concepts we were learning and show how they are applied in real life. I cannot think of one assignment that was not valuable in some way. Below is a brief outline of the assignments and coursework that is due over the course of a week. The class is set up on a Monday- Sunday timetable with the majority of assignments due on Friday or Sunday of a particular week. In addition to specific guidance and interaction throughout the week with me, each assignment in the module contains extensive instructions, content and resources. There are deadlines throughout the week and the occasional online meeting, but students can login throughout the day/week to interact with me, their peers, and to work on their assignments as their academic and family schedule allows. A detailed syllabus is given at the beginning of the year, and students are able to access that week’s syllabus and calendar through our course website. When planned throughout the week, the assignments and curriculum will challenge students but are manageable. I would be happy to provide more specific information as to a particular assignment within a week’s module if contacted. Week Overview – Students are introduced to that week’s module and assignments. The Module for that week opens on a Sunday evening. There is an overview of assignments via our webpage and email update to students and parents. Reading assignment and discussion questions--Reading assignment includes class book, as well as text and literary analysis. This is typically due on Sunday, so students have all week to work on their reading and discussion questions and continue to interact with me and their peers about the text throughout the week. During a particular week, students might have the option of sharing, with their peers, an AP free essay practice response question we completed the previous week. This essay sharing is optional, but provides insight for other students when preparing for the AP exam. These essays are given extensive feedback, guidance, and are graded by the instructor. Curriculum/content topic addressed each week--For example: The SOAPSTone strategy or diction analysis, both of which are tools that can be implemented for success on the AP exam and in writing essays and evaluating reading throughout the year. The content is addressed through an exercise or journaling assignment. Due on Friday or Sunday of that week. 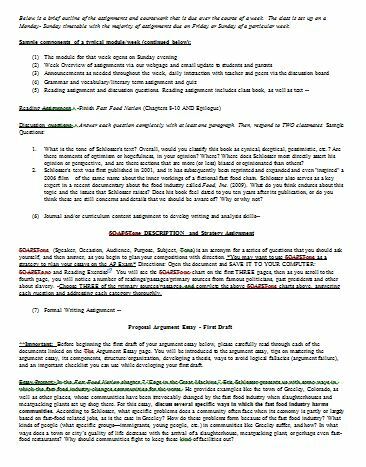 Grammar and vocabulary/literary term assignment and quiz-- Grammar and vocabulary assignments are due on Sundays. Students work on the grammar and vocabulary throughout the week, in their text, and the quiz must be completed by Sunday that week. Long term writing project -- The writing process is a key focus in the course and although students will complete timed essay practice or shorter free write assignments, students are given specific and detailed instruction as to how to succeed in essay writing for the AP exam, college, and beyond. A long term writing project will include an extensive introduction, then a week or two to complete the first draft of the essay. The essays are then turned in, feedback and a grade is given, and students complete revisions before handing in a final draft. During a particular week, a student may be completing ongoing work on an essay. Scheduling survey-- Students are asked to give feedback on their availability so that we can schedule to meet the following week for a live online meeting to discuss their current long term writing project (essay), an upcoming visual rhetoric project and the use of diction in writing (curriculum/content). Students that cannot attend have access to a transcript/recording to review at their convenience.